UK, crown (5 shillings), 1965. Death of Sir Winston Churchill. Image courtesy of forum member Miner. This design was the work of sculptor Oscar Nemon. It always produces mixed reactions. To my eyes, it looks more like a design for an art medal and perhaps not traditional enough for a death commemorative, so soon after the death of the subject. Nor do I like the font that was chosen for the reverse. But disregarding tradition, I do still find it to be a fine portrait, and I like the textured feel to the surface of the coin, which is unique, to my knowledge, on British coins. The Royal Mint originally considered adding an edge inscription to the 1965 crown, which would list his many titles and honours. However, the need was to produce the maximum number of coins in the shortest period of time. Adding an edge inscription would have slowed down production, so the idea was dropped, and the crown was issued with a milled edge. This information appeared in the January 2015 edition of Coin News (Token Publishing, UK). Back issues may still be available. The image is © Coin News / Token Publishing. Cook Islands, 100 Dollars, 1974. 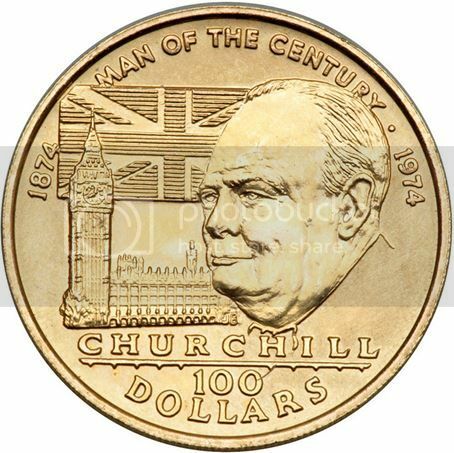 100th Anniversary of the Birth of Winston Churchill. Falkland Islands. 50 pence, 2005. Tristan da Cunha, 50 pence, 1999. UK, 5 pounds, 2015. 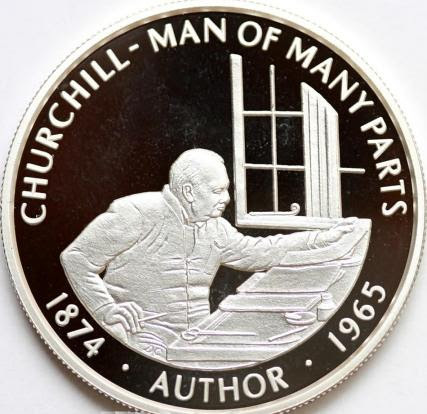 50th anniversary of death of Churchill, by Mark Richards. UK, 20 pounds, 2015. 50th anniversary of death of Churchill, by British sculptor Etienne Millner. Alderney, 5 pounds, 2015. 50th anniversary of the death of Winston Churchill.